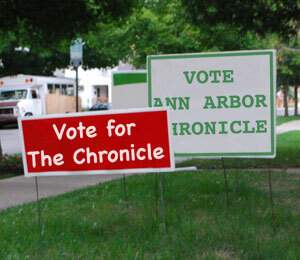 Editor’s note: The monthly milestone column, which appears on the second day of each month – the anniversary of The Ann Arbor Chronicle’s launch – is an opportunity for either the publisher or the editor of The Chronicle to touch base with readers on topics related to this publication. It’s also a monthly reminder to readers who read The Chronicle’s material with a feed reader or some other ad-free mechanism to click through to have a look at the recent ad archive. Some of them are very pretty. Campaign yard signs. We caution against altering other candidates' yard signs ... except digitally. Publisher of The Chronicle, Mary Morgan, wrote a recent column explaining why this publication is not making endorsements of particular candidates for tomorrow’s primary election. She appealed to an analogy of candidates as race horses. But we expect the winning thoroughbreds to pull the plow as draft horses once they’re elected. The draft horse analogy works just as well for The Chronicle as a publication. Mostly what we try to do is plow the field of civic and community affairs in a way that’s as predictable and straight as a furrow left by a well-drilled draft team. We are somewhat plodding. It’s still worth pointing out that we’ve made some of our coverage a bit more sprightly by filing basic results on individual issues straight from public meetings via the Civic News Ticker. We’re successfully piloted the Ticker over the last month. And we’re now content to commit to it as a stable feature. Readers no longer need to wait for days on end to find out how a vote turned out. So for this month’s milestone column I’d like to highlight some of the other draft horses on The Chronicle team – besides Mary Morgan and me. I’d like to make it more clear when readers voluntarily send us subscription dollars, they’re “voting” not just for the two founders of this publication whose livelihoods depend on its financial success. Voluntary subscribers are also voting for the other freelance writers who are helping to pull The Chronicle’s plow, and who earn part of their livelihoods from their work for The Chronicle. Otherwise put, draft horses need some hay to eat. And maybe even some sugar cubes. First, I’d like to provide some rationale for our optimism that voluntary subscription dollars are potentially a viable way of funding a significant part of The Chronicle’s operations. Now slightly more than half-way through the calendar year, voluntary subscriptions total a bit more than $10,000, which simplistically projects to $20,000 for the year. That would be enough to be encouraging, but not enough to sustain us all by itself. We don’t currently expect The Chronicle to be able to sustain itself on voluntary subscriptions alone, but we think there’s room to grow that current number. If historical patterns for voter turnout are consistent, around 10,000 Ann Arborites will participate in tomorrow’s primary elections. Over 3,000 people have already voted as absent voters – that’s based on the daily absent voter reports from the city clerk’s office through Saturday, July 31. I think on average for each of those voters, there’s $100 of value per year in The Chronicle’s reporting – that’s less than $10 a month, or about a cup of coffee per week. And $100 times 10,000 – that’s $1 million. Perhaps it’s overly optimistic to think that Ann Arborites would voluntarily pony up $1 million for good coverage of civic and community affairs. But it’s a number that should be a part of the conversation. A more realistic view might be the pre-primary campaign finance statements from candidates for Ann Arbor city council and mayor. They show nearly $50,000 total contributed to their campaigns so far. That’s still better than twice what we’re projecting for this year in voluntary subscription dollars. John U. Bacon: book author, teacher and sports commentator who writes a weekly sports column that is often as much about what Ann Arbor is, was and could be, as it is about sports. Laura Bien: writes a bi-weekly history column in which she unearths something interesting she’s found buried in old archives somewhere – there’s always some connection to current events. Jennifer Coffman: certified teacher who covers Ann Arbor Public School board meetings and provides meeting reports to The Chronicle’s high standard of detail. Alan Glenn: filmmaker who writes deeply researched articles about Ann Arbor of the 1960s and ’70s. Joel Goldberg: wine connoisseur who writes a monthly column about wine – accessible, smart and full of local connections – that makes for a compelling read even for readers like me, who don’t like wine. Alvey Jones: artist who draws the monthly Bezonki comic – and from what I know of Jones, to my eye there’s autobiographical material in the comic … yeah, that’s really something to think about, huh? Jo Mathis: former Ann Arbor News reporter and columnist who writes a thoughtful monthly column with insights on the community, personal reflections and observations about life. Judy McGovern: former News editor and columnist who writes in-depth local news and analysis pieces for us. Marianne Rzepka: master gardener and former News reporter who writes monthly garden-themed pieces – sometimes about gross bugs and other critters and plants. Domenica Trevor: former News copy editor who writes a monthly book review column that I look forward to reading as soon as it’s submitted. This is my third milestone in a row, but next month Mary Morgan will be back at the reins of the monthly milestone to do the honors of writing the two-year anniversary piece. Here’s hoping she can report a whole herd of new voluntary subscribers. Haw! Comic Sans on your signs? Tsk. Two years next month? Oh, man. Congrats. Your monthly milestones always serve to make me realize how much I count on the Chronicle not for fast news, but for thorough news. Thanks guys! You provide a great new perspective. Have you thought about running some limited, local classifieds as well? For instance, I think garage sale classifieds would be a big hit. And yes, I too like Craigslist. BUT–sometimes it is too cluttered! I think if the system were automated (like Craigslist), people would be willing to pay small amounts of money (say, $2/day?) to support the Chronicle when they are doing things like holding a local garage sale.